Everyone who ever passed through this part of Kentucky or called it home left a story behind. dynamic collections, exhibits, and a genealogical-historical library. We bring all the stories of the Maysville region into fascinating focus. Our Genealogical & Historical Research Library sheds light on the people and events of a seven-county area through an extensive collection of books, manuscripts and documents from the past 300 years. 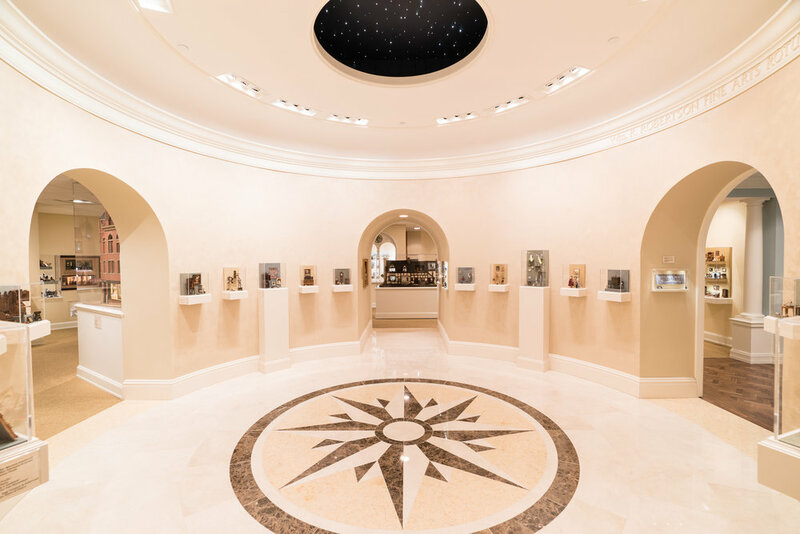 Our Regional History Museum illuminates the past through award-winning dioramas, more than 4,000 regional artifacts and a gallery of fine art related to Maysville and Kentucky. Our Kathleen Savage Browning Miniatures Collection looks at the world from a new perspective through mesmerizing, 1/12-scale reproductions of homes, furnishings, clothing, artwork and people. The Old Pogue Experience housed in the historical Limestone Building adjacent to the Museum Center presents the history of bourbon and the Old Pogue distillery. we invite you to get the whole story at The Kentucky Gateway Museum Center. Kentucky Gateway Museum Center: Four Historic Collections in One Dynamic Place! Explorers. Movie Stars. Artists. Pioneers. Slaves. Everyone who ever passed through this part of Kentucky or called it home left a story behind. Some are stories of courage and great achievement, others of love and everyday survival. The more we explore those struggles and dreams, the more we understand our own. Now, by showcasing four dynamic collections in one place, the Kentucky Gateway Museum Center brings all the stories of the region into fascinating focus: Our Genealogical and Historical Research Library, sheds light on the people and events of a seven-county area through an extensive collection of books, manuscripts and documents from colonial times. 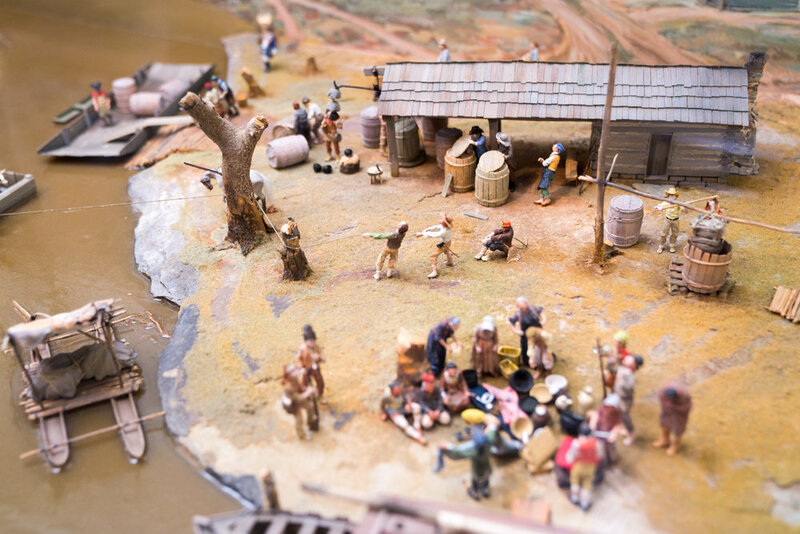 Our Regional History Museum illuminates the past through award-winning dioramas, more than 4,000 regional artifacts and a gallery of fine art related to the area. The KSB Miniatures Collection is celebrating ten years with an exciting eight-month-long exhibition featuring hundreds of newly acquired miniatures. The exposition will highlight some of the most extraordinary examples of fine-scale art to come available in years. Work from legendary artisans of the past and present will be represented, as well as pieces from talented new artisans, displayed on 43 freestanding lit pedestals and in houses and wall cases. Work includes items from every category including textiles, porcelain, fine-art reproductions and precious metals. Our collection houses a wide variety of paraphernalia, including: Historic maps, a Kentucky long rifle, swords from both the Revolutionary and Civil war, a skillet thought to have been used by Simon Kenton, assorted revolvers and knives, a quilt frame, knapping hammer, and prehistoric Native American artifacts.The fine art collection is home to many paintings by Kentucky and local area artists including Steve White, pioneer scenes, local landscapes, and more. We also display numerous items related to Maysville-native Rosemary Clooney, from her recordings to a photo of her in an elementary school play. A visit to The Old Pouge Experience at the Kentucky Gateway Museum Center will take you back in time to the 1791 Whisky Tax Act Rebellion; the heyday of bourbon making in Mason County; the “long thirst” of Prohibition; and the rebirth of an original Kentucky Bourbon, Old Pogue Master’s Selection Bourbon. The Old Pogue Experience is the newest addition to the Museums Center’s extensive collection of historic artifacts and documents, genealogy research library, KSB Miniatures collection and modern-day changing exhibits. Tuesday - Saturday 11am-3pm Located in the Limestone Building adjacent to Museum Center. to be a member of the North American Reciprocal Museum Association. For benefits and pricing please click the link below.